The smartphone market has entered a phase that the personal-computer industry hit several years ago: Devices are useful and good enough that people are buying replacements less often, which pinches sales of new devices. Necessity (and desperation) has been the mother of PC invention. That fallow stretch has been marked by some of industry’s cleverest experiments. (Bloomberg Opinion) -- The smartphone market is following the growth-challenged path of personal computers. That won’t please executives at Samsung Electronics Co. and Apple Inc., but their pain might be great for consumers. Both Apple and Samsung blamed weak smartphone sales for recent disappointing revenue, at least in part. 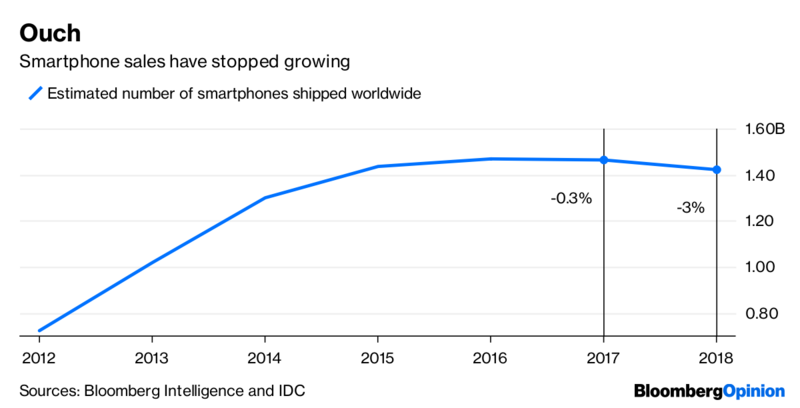 And worldwide, shipments of new smartphones declined slightly for the second consecutive year in 2018, according to estimates from research firm IDC. Necessity (and desperation) has been the mother of PC invention. That fallow stretch has been marked by some of industry’s cleverest experiments. Many companies are mixing PCs with elements of tablets and smartphones, including the ability to connect to the internet with cellular signals. There are more high-end, slim laptops for people who want stylish design and light weight. PC makers have also been introducing a flurry of souped-up PCs tailored to video game diehards with immersive graphics and massive screens, including new designs unveiled at the Consumer Electronics Show this week. Low-cost Chromebooks — cheap laptops that do almost everything through web browsers — have swept through U.S. schools and reshaped technology for classrooms. The stodgy desktop computer is being re-imagined, too. The industry has evolved to make sure there really is a PC for every need and every budget. It might be a blip, but the PC market is slightly growing again after all these developments. IDC estimated that shipments of personal computers worldwide inched up 0.7 percent in the first nine months of 2018 compared with those in the same period a year earlier. Figures for the fourth quarter and full year are expected this week. PC power players such as Microsoft Corp., Intel Corp. and H-P Inc. have posted strong revenue growth recently from their personal computer segments. To be clear, few people expect PCs to resume the rapid growth rates of the 2000s. The devices will never again be the central fixture of most people’s computing lives. But they still have their place. I wrote this column on a PC. Even in the days of controlling computerized machines with our fingers, voices and eyeballs, the classic interfaces have some appeal. I sometimes use my seven-year-old MacBook Air with — sorry, Jony Ive — a mouse rather than its touch-controlled track pad. Just as smartphones cannibalized some of the time and money people spent on PCs, now the same is happening to smartphones. Carolina Milanesi, an analyst at market research firm Creative Strategies, said people are devoting bigger chunks of their budgets and waking hours to newer gadgets such as internet-connected home speakers and wearable devices. With this computing fragmentation, the smartphone market could use a dose of PC-like fresh thinking. The age of the rectangular glass slab has gone on for a long time. The annoying limitations that people complain about, including too-short battery life and too-fragile screens, persist even as screens get bigger and processors faster. My colleague Tim Culpan isn’t excited about some of the coming smartphone technology developments, such as faster wireless internet speeds and screens that fold, that analysts hope will jolt new device sales. Unlike Tim, I’m guardedly optimistic about smartphone screens that fold like books, which Samsung has said it will introduce in smartphones this year. The good news for consumers is we’ve seen this trend of stagnant computer device sales before, and it was helpful. The end of easy growth in PCs forced Microsoft, computer-chip makers, PC hardware vendors and others to think harder about innovation. Consumers got more and better choices. It might not be so bad, for consumers at least, if the smartphone keeps going the way of the PC.